IF there is such a thing as a sure-fire formula for success it has been discovered by a couple of Manchester Irishmen. 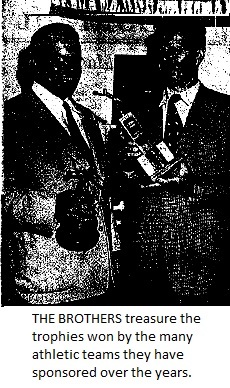 Matthew and Maurice Moriarty cleared scrub brush from the northeast corner of Center and Broad streets in 1933. They erected a $500 wooden shanty on the site and put a gasoline pump out front. The rest is history well known to "Silk City" residents. The brothers in 18 years' time have parlayed their modest start into a multimillion dollar business in a manner as American as the hot dog. 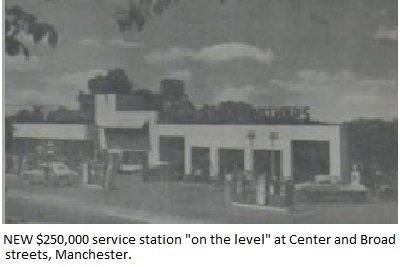 Their modern $250,000 super service station and auto showroom is now a familiar Manchester landmark. But more than that, it's an imposing monument to the men who own it and their unwavering confidence in a formula of fairness, goodwill and hard work. Gasoline sold for almost 14-cents a gallon in 1933 but few pocketbooks could survive the impact of a sale involving more than five gallons. Fuel tanks sloshed emptily and service station operators, like everyone else, grumbled over the impossibility of making ends meet. BANKS were failing and businesses collapsing left and right. The depression was at its peak. Into this glum era came the firm of Moriarty Brothers. Motorists who wheeled into the new service station were delighted to find themselves getting an awful lot of service for their depression dollars. Maurice Moriarty, a "mechanical wizard," repaired defective car motors as a convenience to patrons, charging little or nothing for his work. The brothers startled motorists and bewildered competition with an announcement that there would be absolutely no charge for road service from any point in the state. At Moriarty's motorists found themselves the object of immediate attention by attendants who rendered service and courtesies far beyond the call of duty. "My morale used to shoot up 100 points when I drove in to get a couple gallons of gas," one of their early customers recalls. "Those boys made me, with a half buck in my pockets, feel like Rockerfeller [sic]." Manchester was impressed by this show of generosity but residents felt the boys were behaving in a mad sort of way that could lead only to bankruptcy. However, there was method to this "madness." The brothers were sowing a crop with the seeds of human kindness. Every dollar "planted" by Matt and Maurice has been returned a thousand-fold by ever-increasing multitudes of appreciative customers and friends. MANY business firms have attempted to commercialize on the Golden Rule but have gone down in ruin because of lack of sincerity. "You've got to be honest with yourself and the people you deal with," is Matt's favorite piece of advice to his employees. This effectively sums up the basic philosophy of Matt and his brother. The success of Moriarty Brothers is based on more than a philosophy, however. They labored hard and long in the early days. "Maurice and I often worked round the clock," Matt recalls. "We missed meals on the job and then missed them again at home because we were too tired to sit at the table." Moriarty Brothers from the start has been operated on a 24-hour schedule. A standing joke at the station is that no one knows where the station keys went to "but who cares anyway." That Moriarty Brothers would eventually mushroom into a big operation was envisioned by very few in the early days. Matt and Maurice frequently were seen bumping around town in a 1927 Reo Truck that was missing doors and fenders. The battered vehicle was Moriarty's first piece of mobile equipment. It was used winter and summer as a wrecker, dump truck and delivery wagon. Matt and his wife drove the clattering relic to church on Sundays, leaving a wake of dripping oil, exhaust fumes and sand. 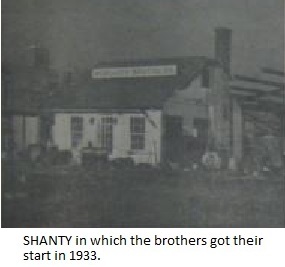 The small shanty in which the boys got their start contained little more than a stove and a cash register. All car repairs were made in the yard and grease jobs were given on an outdoor lift. There was no such thing as an uninterrupted grease job in freezing weather because it was necessary to thaw out the grease gun on the stove every few minutes. "And we had one customer who apparently used 10 below zero as a signal for an oil change and grease job," recalls Maurice with a grin and a shiver. The brothers have a nostalgic regard for "the good old days" but often wonder how they were able to survive some of the bitter cold days they now remember as little more than a confusion of steaming radiators and anti-freeze fumes, skid chains and dead batteries, jangling telephones and impatient customers. In the mid 1930's the brothers seized opportunity by the tail. Cheney Brothers, a local silk manufacturing concern, decided to place on the auction block hundreds of company-owned homes in the neighborhood of the mills (reference Cheney Brothers Property Auctions in this web site). Matt and Maurice followed the auctioneer around from house to house. Their bidding was frequent but never against a tenant trying to buy the house in which he resided. CLOSE of the public sale found Moriarty Brothers owners of scores of houses containing 72 families. Their tenants were relieved and gratified to learn there would be no evictions or rent boosts. Moriarty Brothers recently disposed of most of these homes but the few they still own are renting at the same low levels of depression years, in some cases for as little as $18 a month. 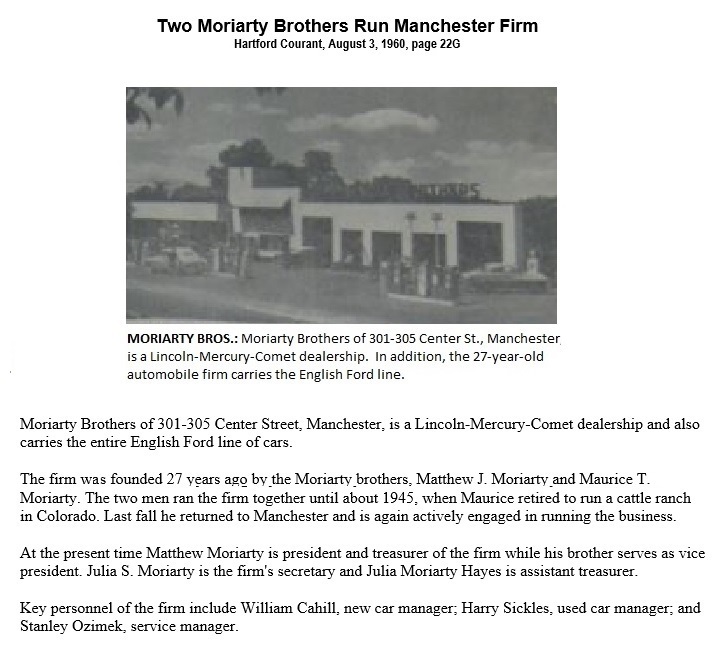 In the early years, Moriarty Brothers stuck exclusively to the sale of gasoline and auto accessories. All fuel oil inquiries were referred to a local oil firm. Matt recalls how the oil firm decided to make a bid for the gasoline business, too, and promptly opened a large service station just down the street. The result was a "gas war" that delighted motorists but almost ruined both service stations. Prices slid to 20 cents a gallon and customers were hauling gasoline home by the barrel before an armistice was called. That wasn't the end, however. The Moriarty Brothers, still smarting from this slap in the face, retaliated by going into the sale of fuel oil and oil burners. This line today represents a tremendous portion of their business. The arrival of WW II found the Moriarty Brothers anxious to contribute to the war effort. Although neither was eligible for service in the armed forces, they worked tirelessly to collect vitally needed scrap metal. USING the service station as a collection depot, Moriarty Brothers in one sweep assembled 150 tons of scrap, processed and sold it and turned a check for $1400 over to the American Red Cross. They sponsored numerous advertisements which urged the purchase of war bonds. They also continued their 24-hours open schedule as a convenience to night-shift war workers although it would have been more economical to close down evenings because of tire and gas rationing and shortage of merchandise. The volume of business had reached gargantuan proportions by 1946. Expansion-conscious Matt began to eye a tract of undeveloped land just east of the station but learned the property was owned by the firm he bucked with a "gas" war a decade earlier. He also heard reports that the rival company was planning to erect another service station on the site. Attacking this threat head-on, Matt, through an agent, made a generous cash offer for the land. The price was so tempting that the sale was rushed through before any thought of checking the buyer was considered. 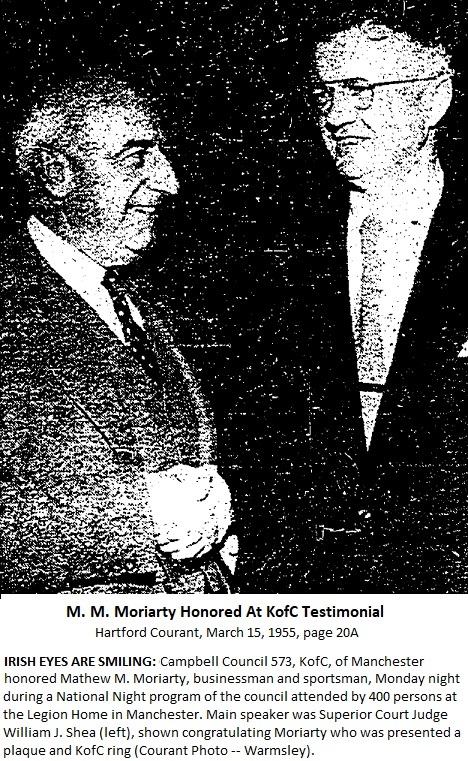 WITH the additional land, Moriarty Brothers in 1947 boldly swung into an expansion program that made Manchester gasp. Up went massive steel beams that dwarfed the small shack in which Moriarty Brothers got its start. The shanty soon was swallowed forever in the mighty maw of the structure which replaced it. Moriarty Brothers today is big business. 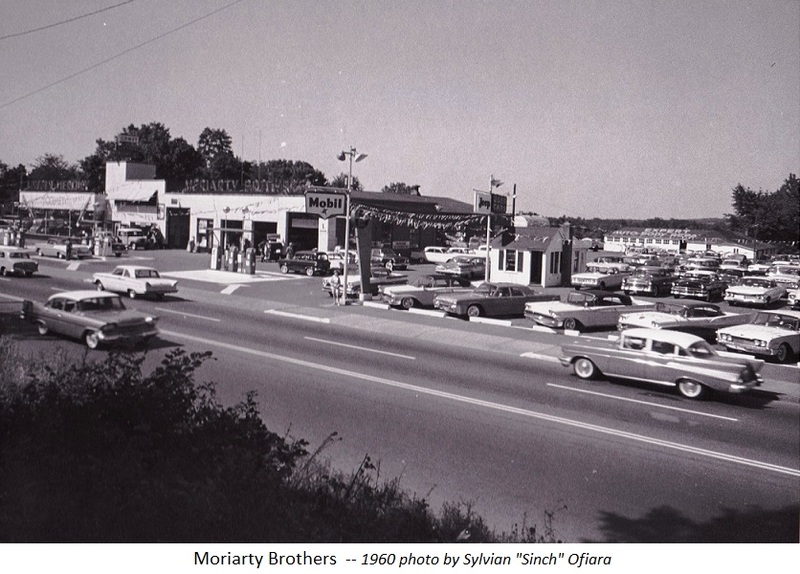 The brothers have opened a new service and sales station, Moriarty's Lincoln-Mercury of Willimantic. Maurice has taken over this branch while Matt holds down the Manchester station. Moriarty Brothers sell some 4,000,000 gallons of petroleum products annually to boost sales four times over the potential of their Mobiloil [sic] franchise. New and used car sales have climbed to more than 100 a month. In 1950, the firm did a $2,000,000 business. This year, Matt predicts, sales will hit the $3,000,000 mark. The Manchester and Willimantic stations are visited by motorists from all points of Connecticut and are known throughout New England. This is because the brothers are advertising conscious, using the mediums of press, radio and television. 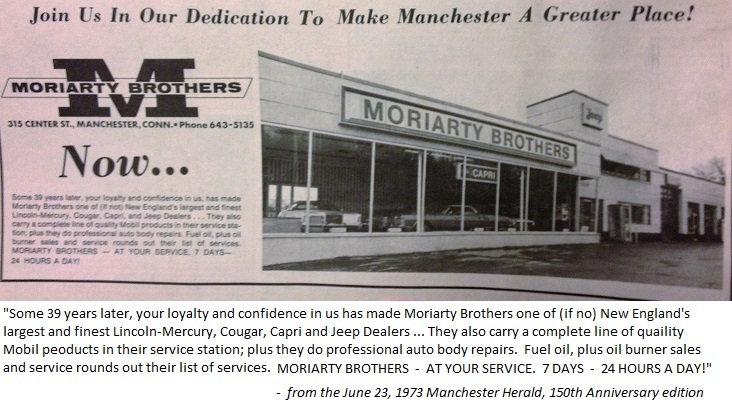 One Moriarty Brothers advertisement is tradition. It's a short paid commercial announced every time there is a baseball game at the West Side Playgrounds in Manchester. 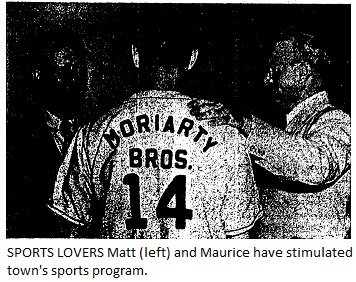 Although the ad is virtually worthless as a business-booster, it gives Moriarty Brothers an excuse to contribute to the support of the town's twilight baseball league. SOME claim there is little resemblance between the Moriarty Brothers today and the Moriarty Brothers of 1933. The friendly atmosphere of early days has been displaced by an air of commercialism, they contend. This is not wholly true. Today, Matt and Maurice have to direct operations, not lead them. Instead of dealing with the brothers personally, customers now are served by a work force of more than 100 men and women. Even so, Matt and Maurice are on the scene as often as possible and constantly emphasize to employees the necessity for courtesy to and consideration of the customers they serve. Shortly after the new station was built, several old-time customers complained to Matt that gasoline pump service was sluggish because attendants were dallying. Matt's answer was to hire a man whose sole duty it is to sit out front of the station and make certain pump attendants don't keep customers waiting. Nor have the brothers abandoned the formula that made them. Their philanthropy has kept pace with the growth of their business. Matt estimates that he has poured some $50,000 into the local sports program at the rate of about $3,500 a year. He refuses to discuss, however, the identity or number of families and individuals to whom he has lent a helping hand and an open pocketbook. BUT from reliable sources come reports that he has sent under-privileged youths through college, seen stricken families through emergencies and underwritten costly medical operations that meant everything to a physically-handicapped youngster or injured athlete. Matt and Maurice are successes in every sense of the word. They have realized early ambitions and amassed fortunes but they don't worship the almighty dollar. They have an appalling disregard for the material things of life but hoard more rewarding treasures: friendship, respect and inner-satisfaction. There is nothing in the physical appearance of the Moriarty brothers that sets them apart from others. Neither would be conspicuous in a crowd. Maurice, youngest of the two, is a powerfully-built six-footer. He is friendly, social, and his good nature is infectious. He is what many describe as a typical easy-going Irishman. A born mechanic, Maurice as a boy perfected his skill with a wrench and screwdriver by experimenting with cars at his late father's service station at the corner of McKee and West Center streets in the early 1920's. Matt is tall, thin and stern in appearance. As president of the corporation, he is the "brains" but goes out of the way to credit Maurice for early successes. Matt still can't distinguish between a carburetor and a fuel pump but he has an uncanny business instinct that seldom fails him. EVEN as a boy Matt had a flair for business. He was still [asking] turnip farmers to let him handle harvesting operations at 10 cents a bushel. He made a nice profit by hiring turnip-pickers at seven-cents a bushel, pocketing the other three cents himself. A graduate of Pratt Institute, Matt took a "leave of absence" from his post as a New York City civil engineer to help Maurice get started in business. He found the service station game an "intrigue and a challenge" so he stuck with it and has never been sorry. He married his school-days sweetheart, the former Julia Sheridan in 1933. The couple have five children. Matt is at the station an average of 12 hours a day, seven days a week, but he somehow finds time to sandwich in his responsibilities to the community as a trustee of Manchester Memorial Hospital and director of the Manchester Savings Bank and the Manchester Savings and Loan Association. He recently was chairman of the local chest X-ray drive. Although a relatively young concern, Moriarty Brothers has survived depression, recession, inflation, war, a hurricane and numerous "gas" wars. The passing years have strengthened, not weakened, the firm because its foundation is strong and its roots deep. If you want to call it that, the Moriarty boys have carved out their empire using chivalry, generosity and tolerance as cutting tools and the Golden Rule as a yardstick. To see the obituaries of Matthew and Maurice Moriarty, please click Obituaries. Click on each icon to bring up a larger version of it, including explanaory text.